For registered attendees only, a special area will be available for trading sand! but please restrict trading to the trading area only. Buffet: A smorgasbord of sediment! Everyone who wants to participate must bring plenty of bags to share and put them on the sand buffet table. Then, you can browse the sands on the buffet at your leisure. Select one bag each of any sand you want until you are full. Swap: Have a seat at a table and bargain one on one with your fellow psammophiles. "I'll trade you these 2 for that one..."
How Many Bags and How Much in Each? 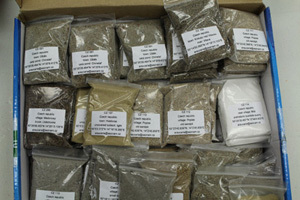 with 30 mL or about 2 tablespoons of sand in each bag. is up to you and the person you trade with. Note: No splitting of samples to smaller bags during trading is allowed. We must keep our area clean, so all samples must be pre-bagged elsewhere and not on-site at SandFest. All bags must be labelled with your name. No anonymous sand! All bags must be labelled with the location where the sand was collected. If the location is unknown, label it "unknown". and click here for a template to print labels with information already filled in. that you must complete and include a check for shipping cost. you must NOT seal the shipping box. Trading Sand -- the best part!